Previously, on MinerBumping... An Agent of the New Order infiltrated a miner resistance channel in Kino. Infuriated by bumpers in the ice fields, miner General Zakev vowed to fit out a tech II Caracal and suicide gank them. The miners took an agonizingly long time to coordinate their brilliant attack plan. General Zakev > great but where is he? While trying to figure out how to land a Caracal on top of the bumper, the rebels stopped to help someone file a petition. Michael Podiene > How do I report being bumped to CCP? A petition? Kyraiela still believed in the rumors that I was permabanned and that all Agents were my alts. Finally, General warped his Caracal next to a bumper and opened fire. 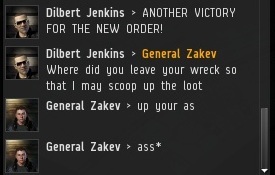 Agent Dilbert Jenkins survived the attack, and General Zakev was wasted by the Concord squad. Where did it go wrong? KnightRider2000 > general did you get poped? 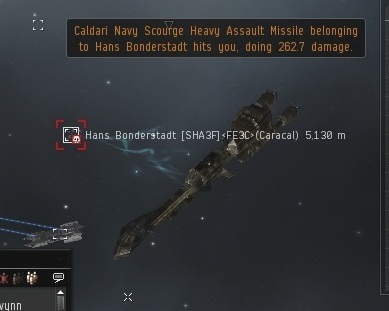 The very same highsec miners who begged CCP to buff Concord and protect them from gankers now suffered the consequences. They didn't like it one bit. KnightRider2000 > you get him? Of course, it wouldn't matter what manner of ganking ship they used; the New Order always emerges victorious. It's kind of our thing. The resistance movement debated whether their best hope lay in continuing to file petitions or to beg for nerfs to Concord(!). If that's the best our enemies have, is it any wonder the New Order is so successful? And so the resistance movement in Kino withered away. The rebels would continue to launch attacks from time to time, but none so coordinated as Kyraiela's "checkmate" maneuver. Incredibly, they didn't stop using Caracals as gank ships. Face it, miners: It's time to join the New Order and find out what real leadership looks like. I hear that Concord is nerfed in null and low sec maybe they would have a better chance there? But they can never nerf the code!!! I think you're on to something. If miners want to AFK, why don't they do it in lowsec and nullsec, where they can shoot at the bumpers without all that pesky Concord interference? Lol miners to beg for CONCORD nerf. Seems to me they finally see the light. OK i admit not all of them but it's a start, so carry on James you're a real savior. Truly only a Grand Master strategist would open with such a renowned move as B4. Known as the Polish Opening, it has a long and storied history of classic Polish offensive strategy. The results speak for themselves!